Without satellites, would forecasting regress to the 1970s? The 1970s may be memorable for many things, but the accuracy of weather forecasting wouldn’t make the shortlist, says Dr Simon Keogh who leads the Met Office Satellite Data Products and Systems group with the third post in a four-part blog series about satellites. Back in those days the accuracy of forecasts was far behind what can be achieved today, largely thanks to our modern-day constellation of sophisticated weather satellites. We can’t feel too smug compared to our 1970s colleagues, though, because much of the modern forecast accuracy we take for granted today, would evaporate if we didn’t have our precious weather satellites. Meteorologists use a process of data assimilation, where recent observations of the atmosphere are used to drive computer models to make predictions about how the atmosphere will change in future. 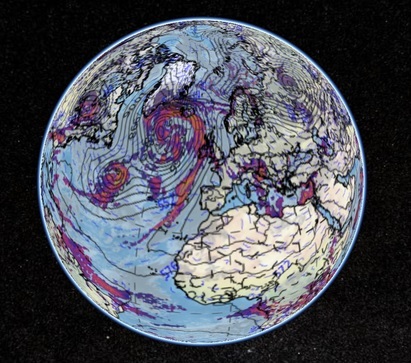 Global forecast map made from Met Office computer model output. A fundamental principle of computer modelling is that the models are only as good as the data you put into them. What this means is that if the observations you put in to drive the model aren’t accurate enough or aren’t complete enough then the effect is like putting contaminated fuel into a sports car: you won’t get the best performance. The same happens with weather models. If the observations that go in aren’t accurate enough, or complete enough, then the model runs out of ‘skill’ quite early, potentially providing useful forecasts only hours ahead instead of days ahead as we’ve come to expect. That’s important because society needs as much notice as possible to respond to severe weather emergency services. Sandbags need filling, personnel need putting on rota and people and equipment may need to be drafted in from other parts of a country to shore up weak spots in defences that severe weather might exploit. All this takes time and severe weather warnings are crucial in buying time for the emergency services. Without these timely warnings the snowploughs, helicopters, fire engines, sandbags and brave emergency workers won’t be where you need them, or when you need them. The next blog in this series, tomorrow, describes how you can spot weather satellites for yourself in the night sky. Dr Simon Keogh leads the Met Office Satellite Data Products and Systems group. He is a member of a United Nations WMO expert team on Satellite Utilisation and Products and is the UK delegate to EUMETSAT’s Operations Working Group. This entry was posted in Met Office News and tagged forecast, Met Office, meteorological satellites, Satellite imagery, Weather satellite. Bookmark the permalink. 1 Response to Without satellites, would forecasting regress to the 1970s? Whilst putting inaccurate data into a model will produce inaccurate results, the results will only ever be as good as the model, no matter how accurate the data.